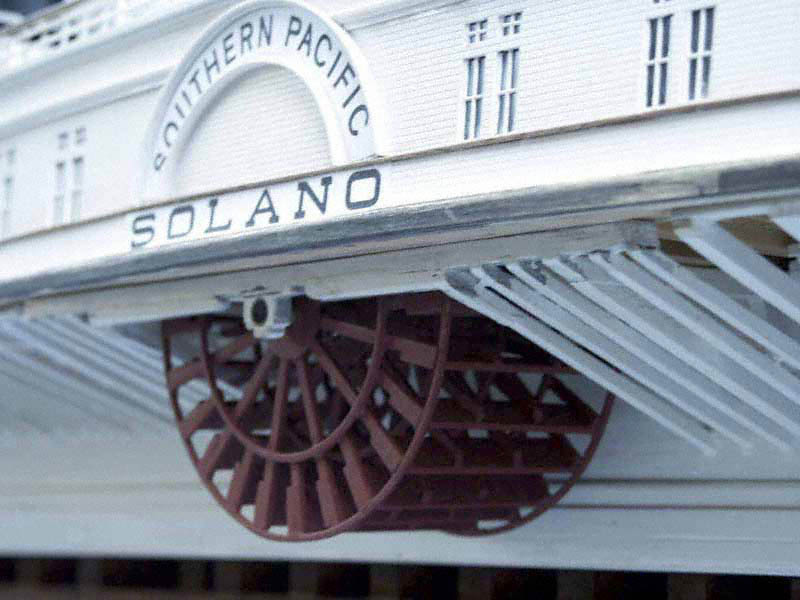 Now the Solano model is nearing completion ... and the Southern Pacific Historical & Technical Society is holding their annual convention in Sacramento this October 1-5. 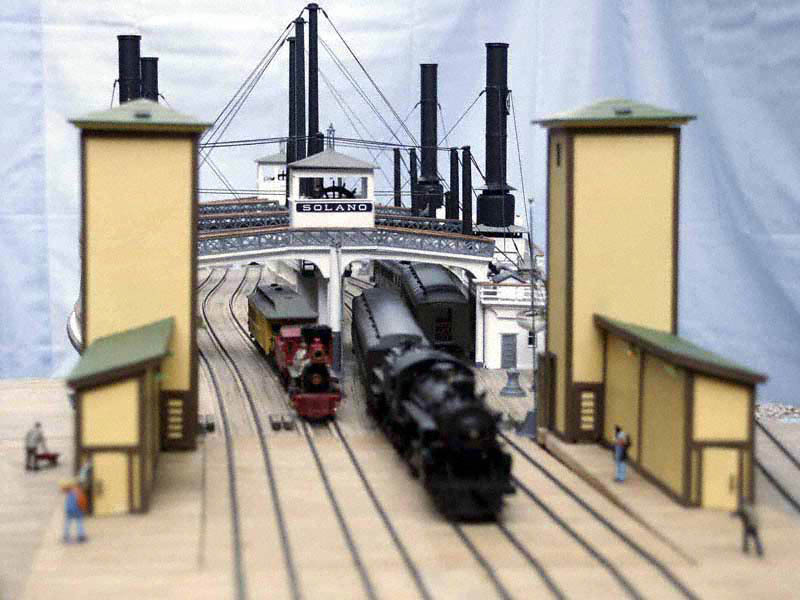 We are contemplating debuting the nearly finished Solano model and her Port Costa dock (minus certain planned features such as Port Costa's train yard, portions of downtown Port Costa, and some near dock structures) at this convention, and possibly other California locations if the opportunity presents itself. The Solano did, after all, play a remarkable role in early California transportation for half a century, so California is where we think she should debut. But we have some large hurdles to jump to get the model from its Michigan home to California. So we are looking for "model sponsors" that might help with funds for shipping and other expenses. Sponsorship agreements could take on many forms, including displaying the model and demo'ing its many features at the sponsor's chosen site for a period of time, or in the form of a listing on the model's back board display. If you have any ideas regarding this, or wish to become a sponsor, let us know ASAP. We could use some help here. Email Bill Rubarth with your thoughts. The Solano plied the straits of California's Carquinez Straits in the northern San Francisco Bay area between Benicia and Port Costa for over 50 years (1879-1930). 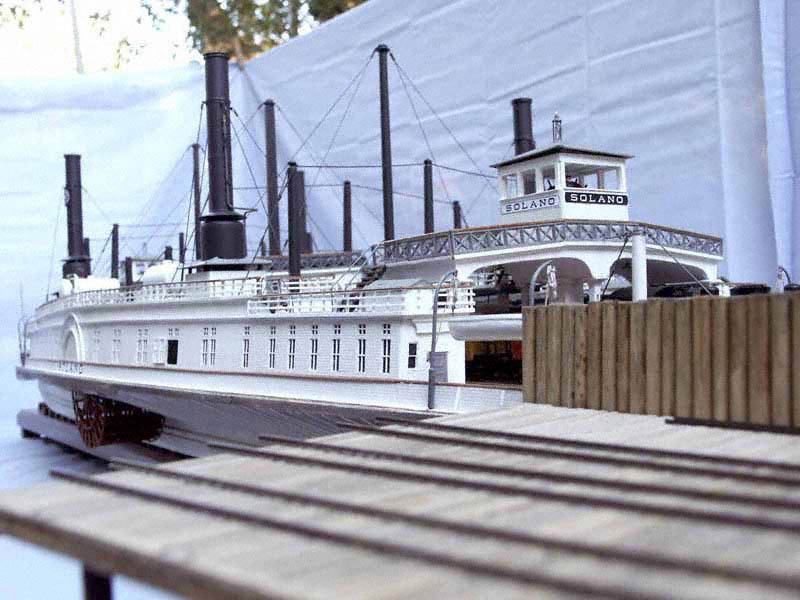 This all wood ferry served brilliantly as a vital link in the Central Pacific's Transcontinental Railroad and later with her sister ferry Contra Costa for the Southern Pacific Railroad. 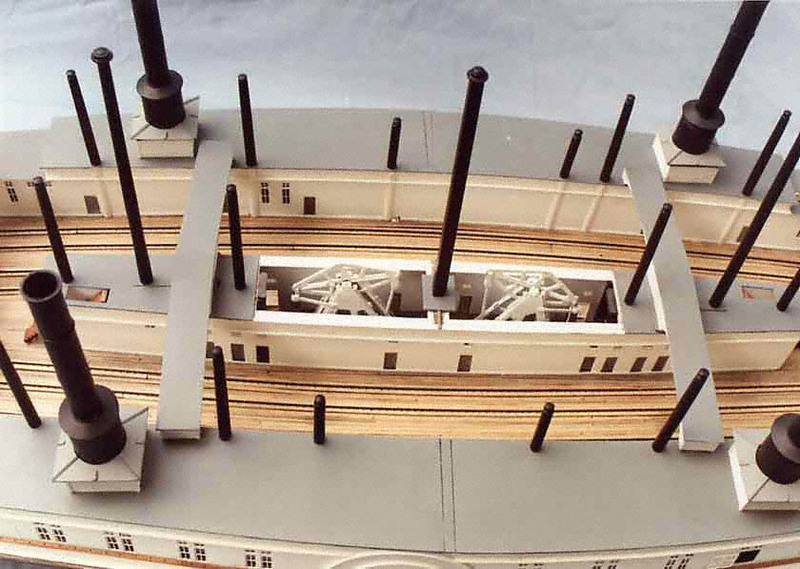 Often claimed as the largest train ferry in North America, her 412' x 110' 4-track deck could easily hide a football field, extending well past the end zones. The fact that she often ferried 2 entire trains, including their road engines AND also a yard switcher, made her the king ... er, queen ... of train ferries. 1. electrified and block sectioned track that demo the unique process in which whole trains were split and loaded on her decks within minutes to keep Transcontinental trains moving at break neck speeds as railroads raced to beat each other across America. 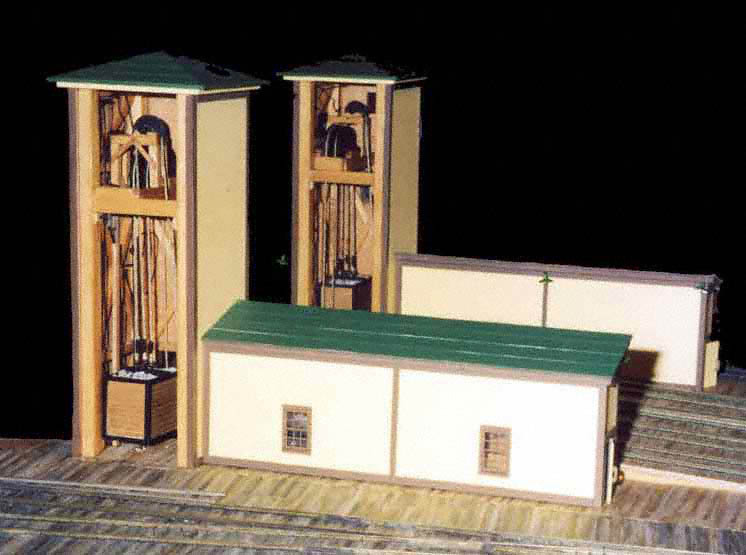 2. her Port Costa dock with a motorized dock ramp – complete with working detailed pulley and weight mechanisms within the interiors of the twin counterweight towers. 8. authentic freight and passenger cars, switchers and road engines the Solano would have ferried during her operations (including a demonstration on how rail equipment grew tremendously in weight and size during her life time (1879-1930). 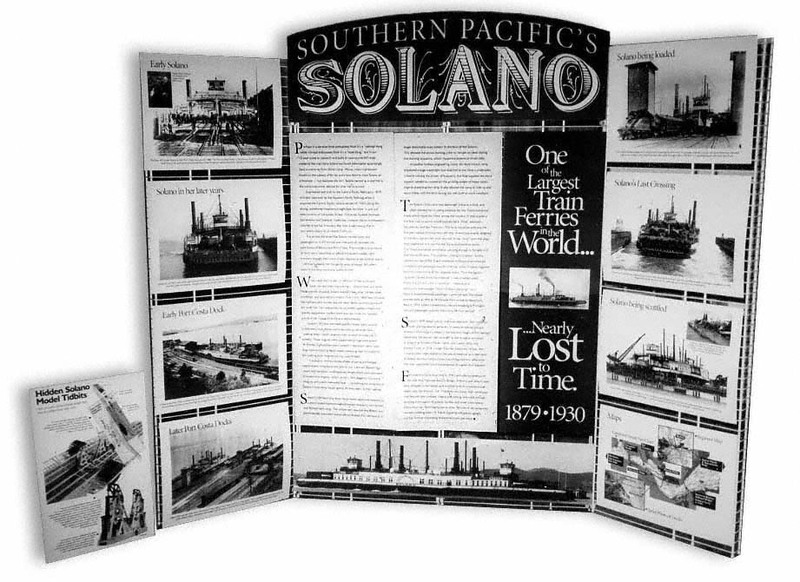 9. a backboard display with historical pictures of the real Solano in her early and later years. 10. a collection of Solano stories and tidbits, including where her remains are laid to rest. ** These features come complete with rechargeable battery system and wireless remote control for "away from dock" operations. All in all, this is a very complete model. It's also a very rare model since, throughout the years we've been researching and working on the Solano, we have yet to come in contact with any other individuals involved with a full Solano model. We invite all of you to see this piece of history sometime, either at the upcoming SP convention or perhaps at other sites as they materialize. We'll keep you posted. And again, thanks! Courtesy Thomas Rubarth, Bill Rubarth, and Jim Turner. 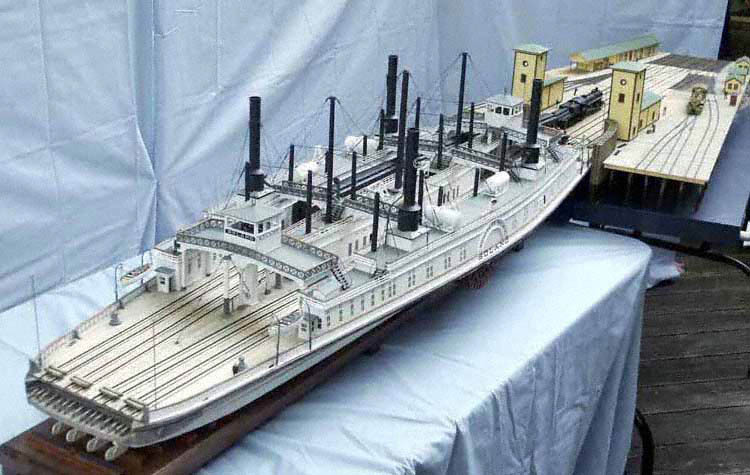 Also see: Modeling the World's Largest Ferry Boat, the CPRR "Solano" Courtesy Thomas Rubarth. The Largest Train Ferry in the World Returns to Benicia! … Albeit in a bit smaller form. Between 1879 and 1930 Benicia and Port Costa served as port cities to what was then billed as "the largest train ferry in the world!" And this train ferry, the Str. Solano, WAS huge. 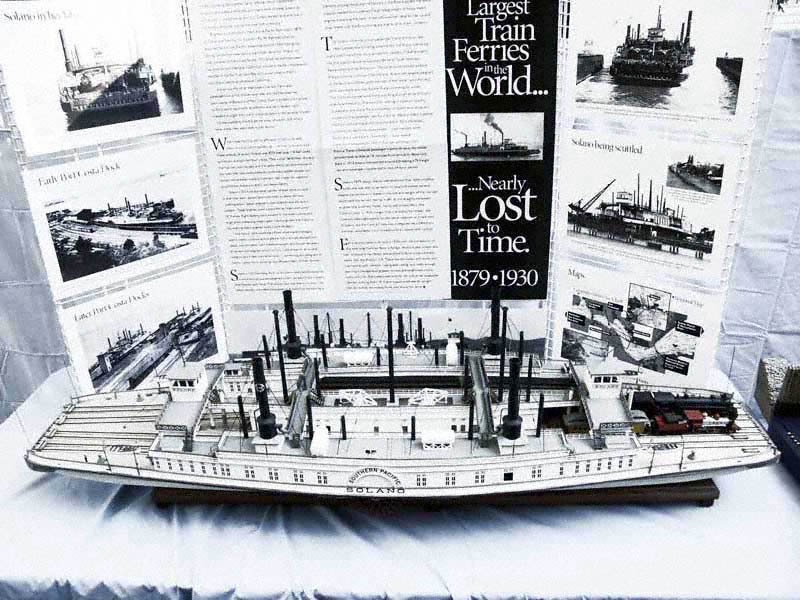 At 424 feet long by 116 feet wide, she was easily the largest ferry in all the San Francisco Bay area! 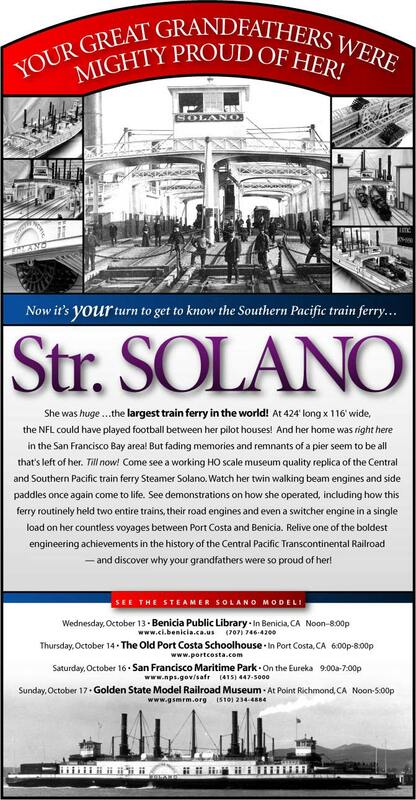 While most train ferries could not accept even one heavy train engine on their decks, the Solano routinely carried two entire trains and their road engines — plus the switcher engine used to split and load the trains onto Solano’s four tracks. Come see the Str. 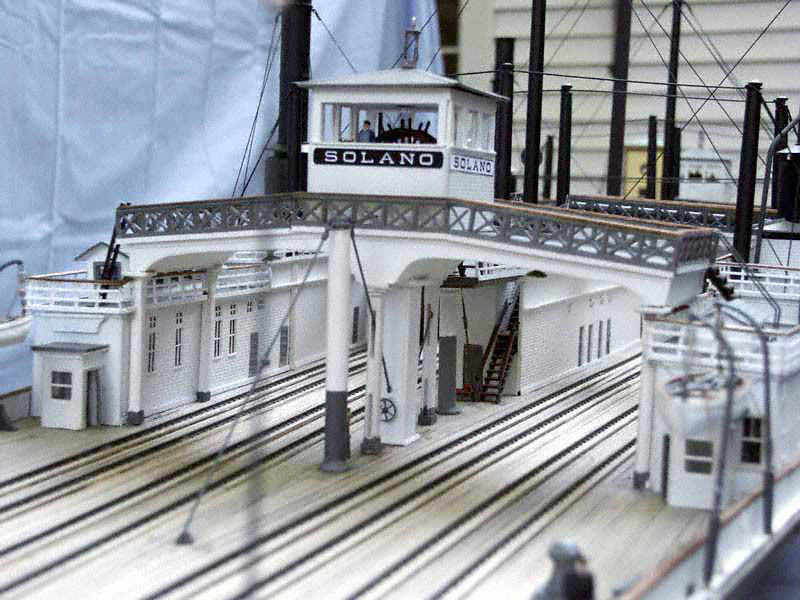 Solano come alive once again, if only in miniature! 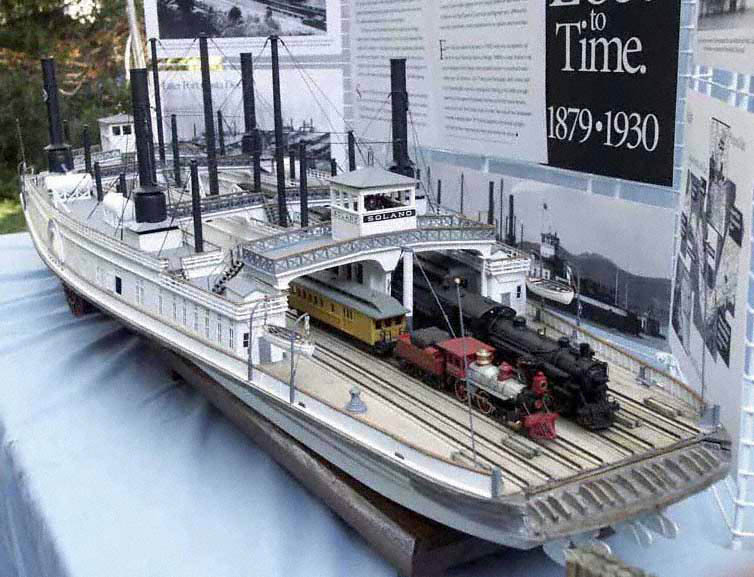 An HO scale model of the Solano and her Port Costa dock will make a rare and brief tour through the Bay Area this October. Built in Michigan by Jim Turner and Bill Rubarth, with research help by Thomas Rubarth in Arizona, this may very well be the only museum quality model of the Solano in existence. 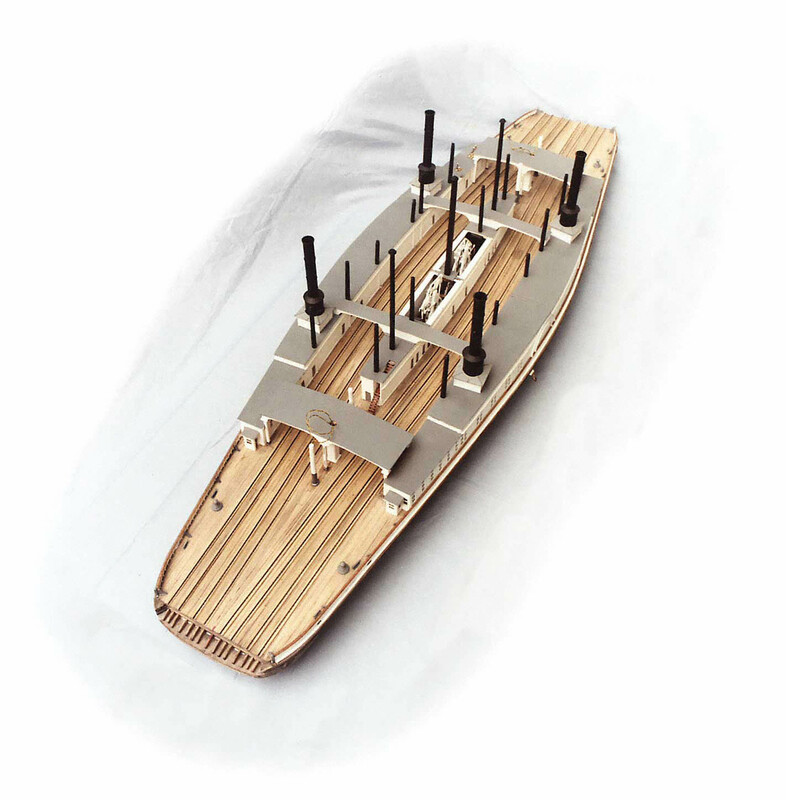 This is a "working model" – with motorized twin walking beam engines and side paddles, and even a motorized dock track ramp – all designed to make the Solano "come alive." 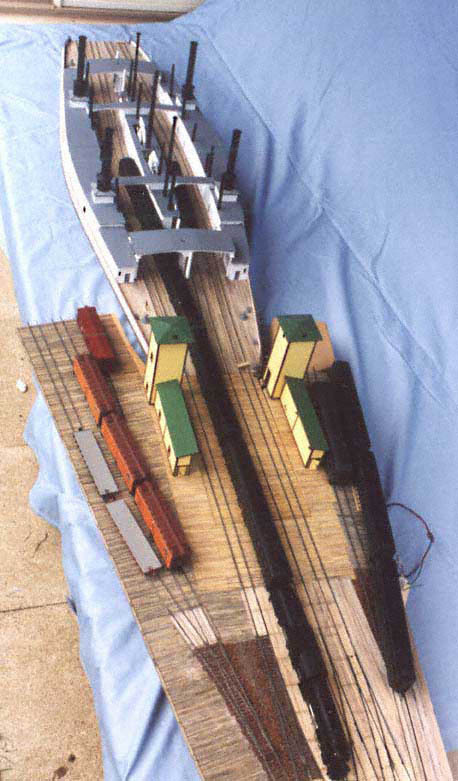 The model also has electrified track to demonstrate how the real Solano was able to load and transfer trains so efficiently that her owners published a brief 15 minute stop to stop time between the Benicia and Port Costa stations, although a mile long sail across the Carquinez Strait stood between them. 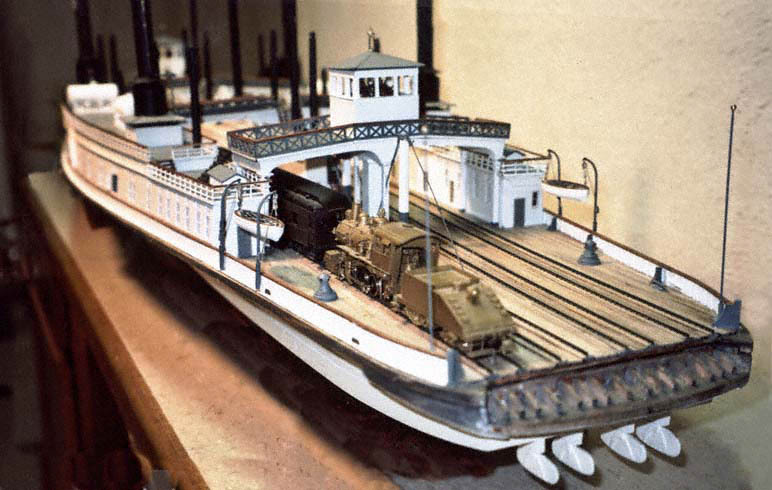 If you are interested in the rich history of Bay Area railroads and ferries … or if your great grandfather worked or told tales of such a boat … or if you simply have been curious about the string of old dock pilings at the end of First Street on Benicia’s waterfront, take the time to see this unique model. And if you are one of the few who actually remember the real Solano, we extend a special invitation to you, since we would like to document what you remember! 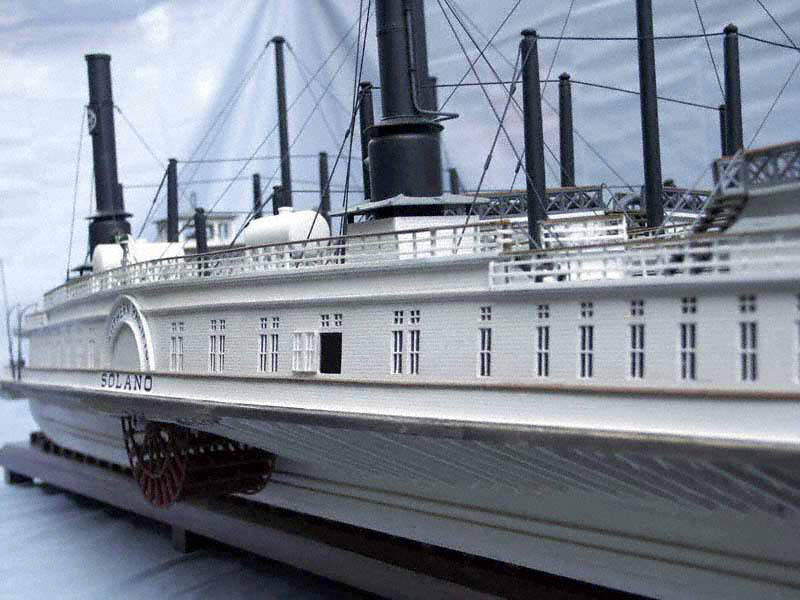 Unfortunately, due to the expense and difficulties of transporting such a large and fragile model from Michigan to California, it is unlikely that the Solano model will be able to tour the Bay Area again. So if your interest is piqued, be sure to drop by. 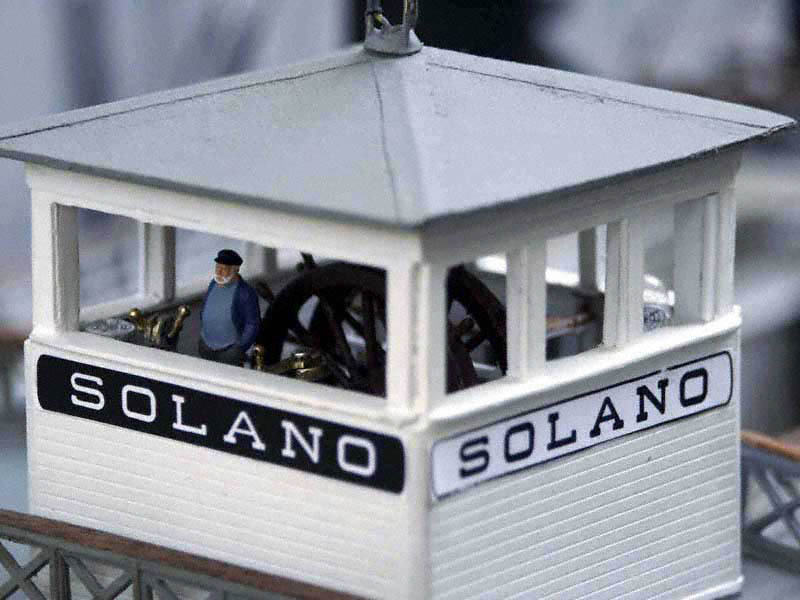 With the exception of normal museum admission prices, the Solano model viewing and demos are free. 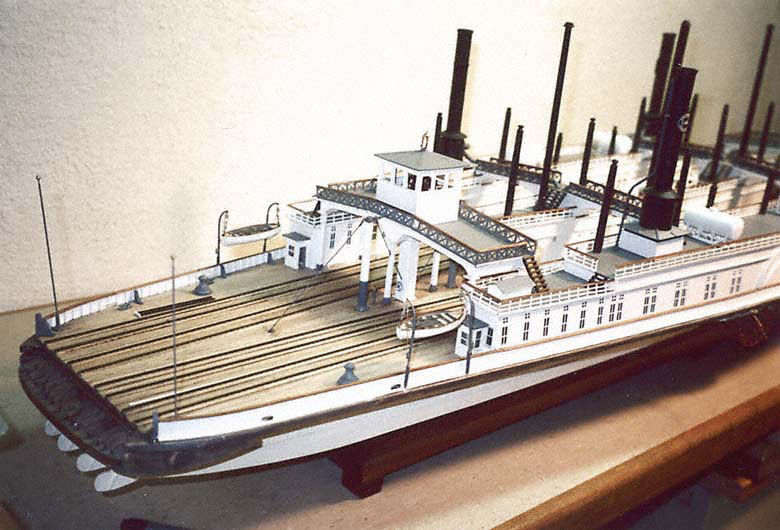 The CPRR Museum has posted a package of Solano Ferry Plans, courtesy of Thomas Rubarth, Bill Rubarth, and Jim Turner. 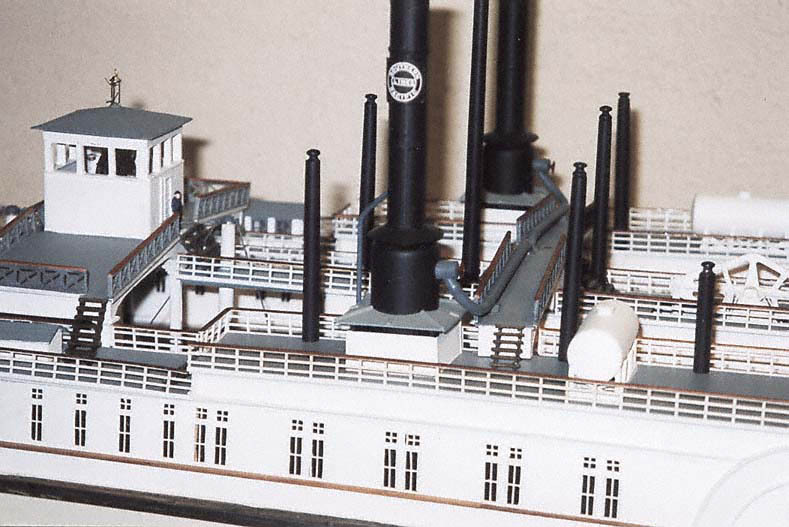 I love the story of building the model of the SP transcontinental train ferry that used to cross near Benicia. I understand the model was in California a few years ago. Can it be seen today? And what was the destination of the train – Sacramento?? The Solano model is currently in the Detroit, Michigan area with my brother Bill Rubarth. It is often shown at local area train shows. Several years ago we made the trek from Michigan to the SF bay area to show the model to her port cities. The surviving old timers that rode the real ferry got a kick out of that. 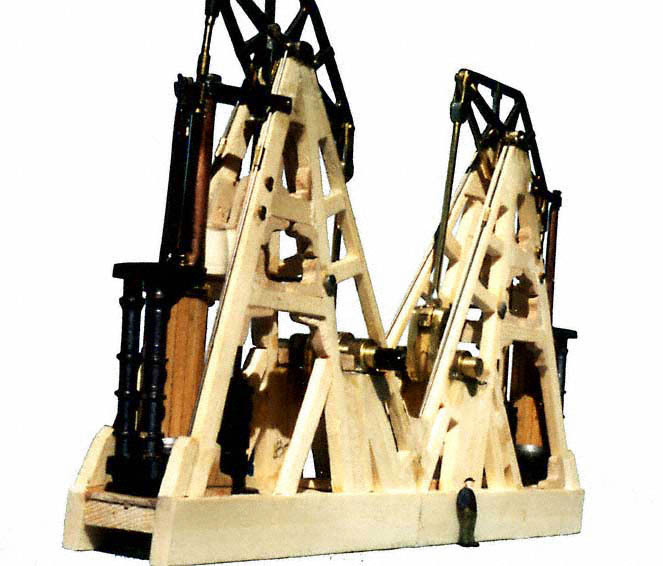 But at just over 5 feet long the model is not suitable for shipping, so it took considerable time and money to drive it to California. We'd love to take her back to CA again but at the moment we have no specific plans to return her to her stomping grounds. That's a shame because we know so much more about the real Solano these days and Bill can give quite a spiel about her. Someday the model will be donated to a Bay Area museum. The Solano crossed the Carquinez Strait between Port Costa and Benicia CA. This crossing made possible a shorter, more direct, and flatter Transcontinental mainline route for the Southern Pacific Railroad between Oakland and Sacramento. Until the Solano appeared on the scene, mountains and swamps forced the SP mainline to travel south out of Oakland, then climb through Niles Canyon and Altamont Pass (using helper engines), then circle back north through Stockton to get to Sacramento. Thanks for your interest in the Solano. It's always nice to hear from someone interested in these old ferries! 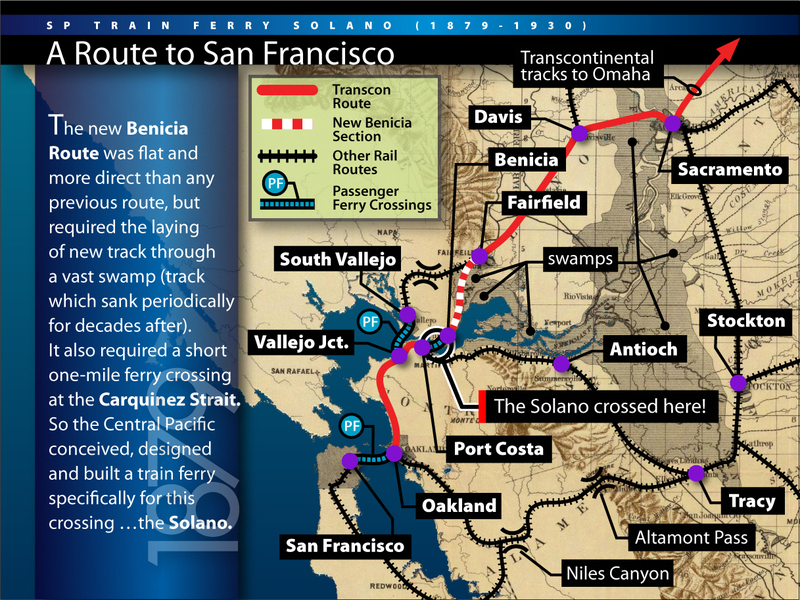 Here's a slide that shows the SP routes in regards to the Solano.